People from all over the world visit London for leisure and business, increasing passenger numbers and servicing trips that may affect the way people prefer to travel whilst visiting London and its surrounding areas. Expectations of people on how they choose to travel keeps changing and travel behaviour can be based on various factors including comfort, accessibility, information on services and budget. For someone travelling from London Heathrow Airport to anywhere in and around London they have many options to choose from, namely the London Underground, airport shuttles, buses, coaches, rail, trams, black taxis or private hire minicabs. Heathrow express runs from Heathrow to Paddington every 15 minutes and takes approximately 15 minutes journey time to reach Paddington. The Heathrow connect train is cheaper and a tad slower. Train stations along the route are accessible to most of the major hotels and other areas of interest. Shuttles help passengers reach nearby hotels and restaurants. The National Express is often chosen to travel long distances. Black cab rates might vary from time to time or considering the distance and they can only accommodate a maximum of 6 passengers with limited luggage capacity. 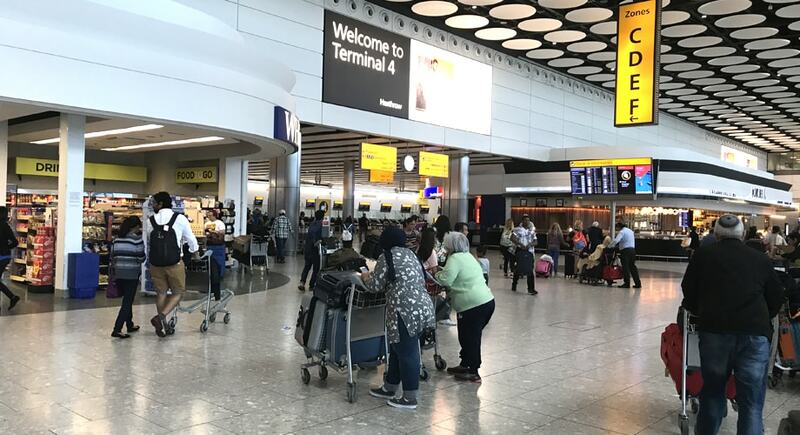 For more than two or three passengers travelling together, either as a family or a group, hiring a private hire minicab to and from Heathrow will be a great or wiser choice. Vehicles are available for the exact number of people and would be well within your budget. Saloon and Estate vehicles are suitable for up to 4 passengers. Feel free to choose the Saloon vehicle option if you are travelling light with 2 check in luggage and 2 hand luggage, or alternatively opt for the Estate vehicle which is more suitable for more luggage such as 3 check in luggage and 3 hand luggage. For a group of 5 you can hire an MPV vehicle, 5 seater cab that is comfortable for 5 passengers and has sufficient space for 4 luggage and 3 hand luggage. An MPV Plus is ideal for 6 passengers providing ample space for 5 check in luggage and 3 hand luggage. While travelling as a group large taxis are the best as it saves the effort of dragging your luggage around and waiting in queues for buses or trains. For a group of 7 or 8 passengers the 8 seater vehicles makes it a clever move as it helps you travel in comfort and avoids crowded public transport. The large taxi is spacious to hold 8 check in luggage and 8 hand luggage. Child/Infant seats can be obtained upon request allowing ease for both the child and other passengers. All the planning and effort you need to put in to travel from Heathrow Airport to London as a large group can be removed if you choose Private hire Taxis and Minicabs that are sure to be good value for money. It is true that public transport can be less expensive, but trying to reach other airports for connecting flights especially when travelling as a group can be quiet challenging and the London trains and underground stations can be quite far from where you really need to go. Large taxis and cabs from Heathrow Airport to London offer door-to-door service that makes your journey much easier. The Drivers will assist you right from greeting you at the airport with a name board, assisting with luggage and manoeuvring through traffic, all in all trying to ensure you reach your destination on time. The fares are transparent and you pay what you see, any diversions or stopovers can be requested at the time of booking. In addition to the requested waiting time you can benefit from the additional 30 minutes waiting time and you can contact our live support staff 24/7 for all bookings and queries. Large taxis and cabs from Heathrow London airport are the best way to ensure safe and stress free travel making it enjoyable than just a chore.